"Bob Kleberg trading cattle with peeler. First time King Ranch purchased Longhorns. Kleberg had photos taken to Document the historical event. He used the images in advertising sale catalog in 1960's." Cattle were not indigenous to North America, but were introduced by gold-seeking Spanish conquistadors. Texas Longhorns are descended from these first cattle brought to the Americas over 500 years ago. Christopher Columbus brought Spanish cattle to Santo Domingo in 1493 and within 200 years their descendants had spread into Mexico. The Longhorn did not have many enemies. Native Indians did not hunt the wild cattle; they preferred the meat of the tamer and easier to kill buffalo. The Indians also found more uses for buffalo hides and bones than they did for Longhorn leather. Wolves that followed the migrating buffalo herds remained shy and wary of the mean and often deadly Longhorn cattle. With the waning of the buffalo herds, the prairie grasses from Mexico to Canada became fodder for this new, more marketable animal. Most non-Indian Americans never developed a taste for buffalo, and more and more people were taking a liking to beef. A single Longhorn cow needed 10 acres of good plains grass a year for feed, 15 if the ground was dry and scrubby, and there were millions of acres available. Living on the rich Texas plains, a cow would normally have 12 calves in her lifetime, ensuring a steady supply for the new market. During the Civil War, the unattended Longhorns proliferated. By 1865, about 5 to 6 million Longhorns resided in Texas, and most were unbranded. With the destruction of the buffalo following the Civil War, the Longhorns were rushed in to occupy the Great Plains, a vast empire of grass vacated by the buffalo. Cattlemen brought their breeding herds north to run on the rich grazing lands of western Nebraska, Wyoming, the Dakotas, and Montana. Thus, the Great Plains became stocked largely with these "bovine citizens" from the Southwest. And, the Texas Longhorns adapted well to their expanding world. They had reached their historical heyday, dominating the beef scene of North America like no other cattle breed has done since. However, the romantic Longhorn era came to an end when their range was fenced in and plowed under and imported cattle with quick maturing characteristics were brought in to "improve" beef qualities. Intensive crossbreeding had nearly erased the true typical Longhorn by 1900. The Texas Longhorn was fashioned entirely by nature right here in North America. The Longhorn became the sound end product of "survival of the fittest". Shaped by a combination of natural selection and adaptation to the environment, the Texas Longhorn is the only cattle breed in America which - without aid from man - is truly adapted to America. Their unique instincts aid them in finding food and shelter during times of rough weather. Longhorn calves are very tough and can stand up sooner after birth than most other breeds. Longhorn cattle can breed for many years, well into their teens and twenties. Longhorn meat is becoming more popular in today's low fat/low cholesterol food market. A Texas Longhorn steak has less fat and cholesterol than a chicken breast. Credits: Harvey Patteson & Son Photographers. 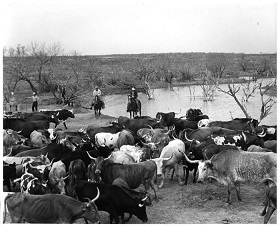 [Field of Longhorn Cattle], Photograph, 1952; (http://texashistory.unt.edu/ark:/67531/metapth44331/ : accessed April 29, 2015), University of North Texas Libraries, The Portal to Texas History, http://texashistory.unt.edu; crediting Cattle Raisers Museum, Fort Worth, Texas.